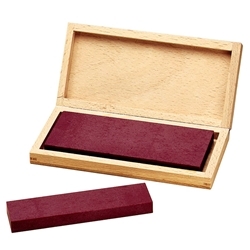 Degussit Ruby Bench Stones are ideal for sharpening tools and gravers – even carbide. May be used dry or with Gesswein Stoning Oil. The pure, sintered crystals of synthetic ruby have an outstanding resistance to wear, which makes them more economical than other stones. They will not groove even after years of use. In addition to metals, they may be used on other materials such as glass, porcelain and quartz. Ideal for sharpening knives and gravers made of high speed steel or carbide. Available in 4", 4-3/4" and 6" lengths, medium and fine grits, and finished on one side or both sides. See "Dimensions" tab above for more details. 1-sided stones are mounted in an attractive wooden box and are usable on one side only. 2-sided stones come in a plastic storage box and are usable on both sides. * Stones finished on one side only are glue-mounted in a wooden box. Stones finished on both sides come in a plastic storage box.